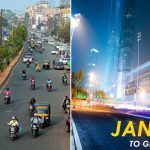 Sudarshan Patnaik Makes Guiness Record By Making Worlds Biggest Sand Art Of 48ft. It's Huge! 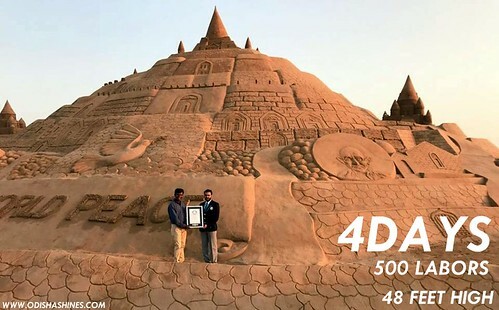 Sudarshan Patnaik Makes Guiness Record By Making Worlds Biggest Sand Art Of 48ft. It’s Huge! Everyone must have been to any sea beach at least once and no one can’t deny that they all love building sand castles by the beach. But when you turn this love into passion and dedicate yourself to make it large like Sudarshan did, your name as well might be on Guinness World Records someday. Sudarshan Patnaik as we know is the insanely popular sand sculpturist from Odisha but known worldwide. He is truly Mr. International when it comes to make sand sculptures a life like charm and everytime he crafts one out of sand he gives a message through it, which is loud & clear and echoes through the world saying “World Peace”. Yesterday Sudarshan built world’s biggest ever sand castle which stands at Puri beach. It took him 4 days and the help of 45 students along with 500 labors to make it possible. It’s enormous and stands tall with 48.08ft of height. Built over half an acre, this is truly world’s biggest sand castle which broke the previous record of a sand castle being 45.10ft tall. 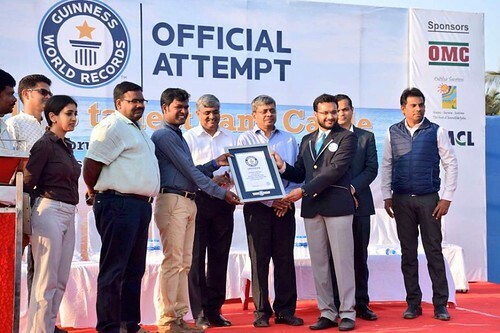 Currently Sudarshan has already eight world records to his credit with the Limca Book of World Records, including one for carving 100 sand chariots and a 45ft tall Santa Claus on Puri beach. He also trains some magnificent young talents in sand art at his institute in Puri. Hopefully they all will make a record of their own someday and make Odisha proud.